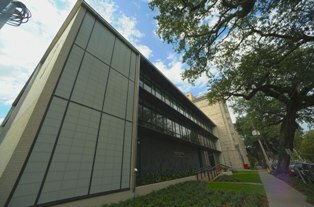 The Stuart H. Smith Law Clinic and Center for Social Justice, along with the Office of Career Services at Loyola University New Orleans College of Law, have found a new home just a block away in the new College of Law Broadway Building, following a lengthy renovation. The Broadway Building, formerly known as the Dominican Conference Center and designed by Fernandez & Johnson Architecture, will have a dedication and open house on Tuesday, Oct. 25 from 5:30 – 7 p.m. It is free and open to the Loyola community. RSVP’s are required by Thursday, Oct. 20 by contacting Bart Folse at 504-861-5555 or bfolse@loyno.edu. In 2008, Stuart H. Smith, J.D. ’86, pledged a major gift to the College of Law. The Law Clinic at the college was renamed as the Stuart H. Smith Law Clinic and Center for Social Justice as a result of Smith’s generous gift. A portion of his gift was also used to endow a new professorship to honor of one of Smith’s mentors at the law school, John P. “Jack” Nelson, Jr. Professor Nelson, who died in 2006, was also an alumnus of Loyola’s College of Law. “Without the financial support and education I received at Loyola, I would not have achieved the success that I have,” said Smith. The clinic is a fully functioning legal clinic which allows third-year law students the opportunity to represent indigent clients under the supervision of experienced attorneys. Career Services educates law students and alumni regarding their professional development in the practice of law, and the methods of achieving career ambitions and employment options that exist for those in possession of a Juris Doctor degree. By participating in the Law Clinic, the Extern Program, and the Street Law Program, student practitioners not only have the chance to experience firsthand what representing clients is like, but they also have an opportunity to further the Jesuit ideals of scholarship and service at Loyola by providing legal representation to the needy. The Dominican Conference Center, at the corner of Broadway and Dominican Streets, was built in 1958 as a student residence hall for Dominican College. A contemporary adaptation of the existing modern style building now allows additional “elbow room” for the Law Clinic and Career Services. The extensive renovation of the building focused on creating necessary spaces for offices, conference rooms and classrooms to relieve inadequate facilities for these programs. In line with Loyola’s stewardship goals, the project is striving for Silver Level LEED certification by the U.S. Green Building Council. As a result, energy, air quality, and water efficient design were paramount in all decisions related to the renovation.